MIDDLETOWN, Conn. — One of the largest construction projects currently underway in the state of Connecticut, work nears completion of the new FedEx® Ground distribution hub in Middletown, Middlesex County, that will include over 310,000 square feet of segmental retaining wall block built to a maximum height of 60 feet—making it one of the largest and tallest SRW projects in North America. According to representatives at FedEx, this project, which broke ground in May 2016, is part of a nationwide expansion resulting from the exponential increase in the number of daily packages shipped over the last 10 years. 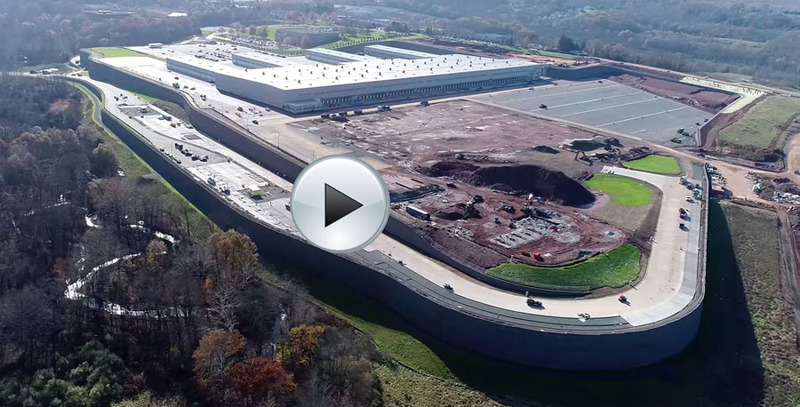 * The 260-acre site is the former location of the Aetna Life Insurance Company headquarters and will house a 508,000-square foot main hub building along with a maintenance garage and salt storage shed. The project involves an an astounding 1.5 million cubic yards of earth work that required six retaining structures, encompassing over 11,000 linear feet of retaining walls to re-grade, stabilize and optimize the site. The project also called for over 630,000 square yards of geogrid soil reinforcement. Oldcastle worked with the project geotechnical engineers during the design phase to secure Anchor Vertica® wall block with Mirafi® geosynthetic reinforcement as the basis of design for the project. Anchor Concrete was selected as the exclusive supplier of the retaining wall and geogrid materials using Anchor's Cranston, Rhode Island, plant to manufacture the wall units. “This selection was based on competitive price, proximity to the project, technical support, manufacturing capabilities, and overall resources to supply such a large project on a tight time frame,” Vollmer said. As of May 2018, the overall wall project is on schedule to be completed this year with Anchor having shipped approximately 300,000 square feet of block to date. General Contractor: Manafort Brothers, Inc.
Site Work Contractor: Borggaard Construction Corp.